Advantages: A versatile set that will be useful for vignettes or dioramas in any modern military or civic setting. With the increasing number of modern vehicle and figure set releases recently, J’s Work from China has come up with a new range of diorama accessories. One of these is their 1:35 scale Modern City Check Point. This simple but very useful set provides 43 injection moulded plastic parts making up four concrete barriers, three plastic water barriers, two portable metal fences, one streetlight and seven witches hats (or traffic cones if you prefer). These accessories suggest plenty of interesting painting and weathering possibilities, incuding hire company stencils, billboards and graffiti. 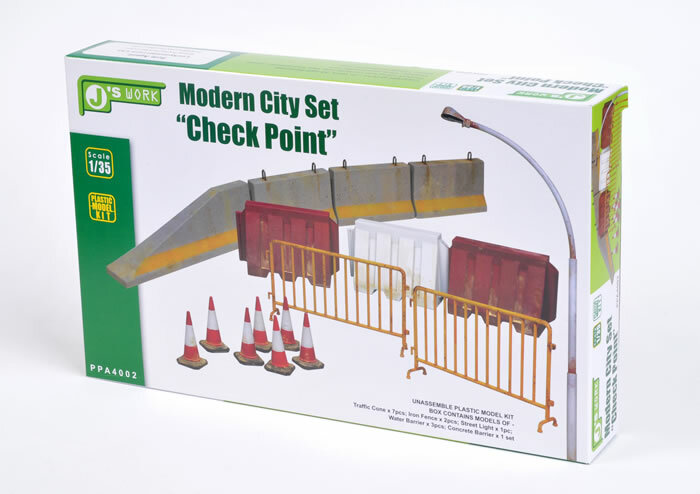 J’s Work’s 1:35 scale Model City Check Point is a really versatile set that will be useful for vignettes or dioramas in any modern military or civic setting.